Flow of events are the steps required to perform within a use case. Now, with Visual Paradigm, you can define complex flow structure by specifying control flows, such as if, while and jump, within the steps. This tutorial is going to demonstrate how to define control flow within the flow of events. Download Game.vpp. You can also find this file at the bottom of this tutorial. 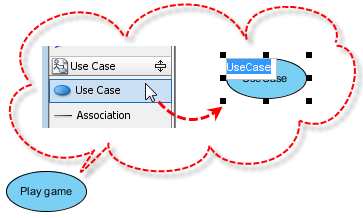 Create a new use case diagram. 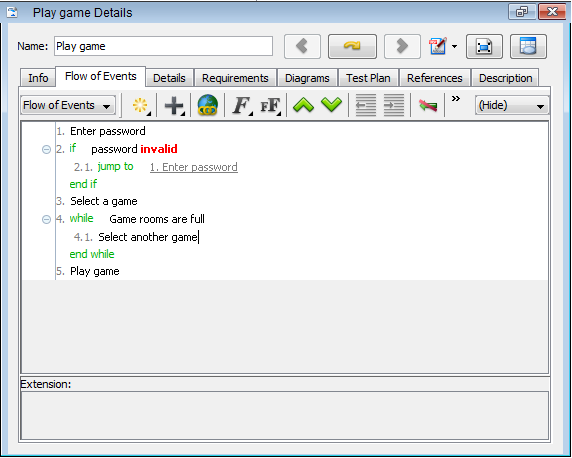 Create a use case through diagram toolbar and name it as Play game. Right click on Play game use case and select Open Use Case Details... from the main menu. 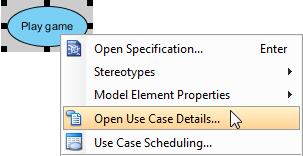 When the use case details is opened, click Flow of Events tab to start editing steps in flow of events editor. 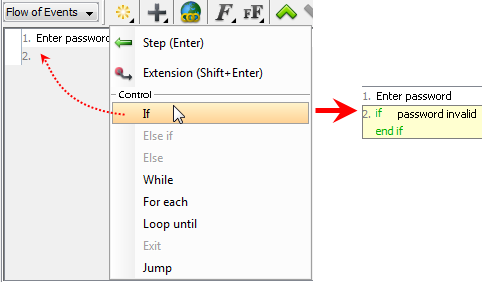 You can insert If from the control menu to explain the variable situation. In this example, the first step is Enter password and the variable situation is the player may enter and incorrect password. Let's select If from the control menu and enter password invalid. 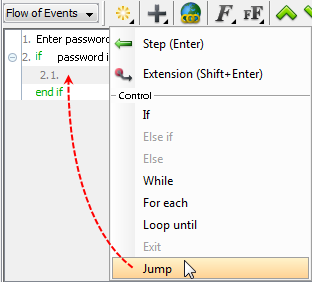 You can also insert Jump to manipulate the sub-step after the variable situation happened. In this example, when the player enters an incorrect password, s/he is expected to go back to the previous step to enter password again. Let's select Jump from the control menu. Click the upside down triangle of jump to to select Select target from the pop-up menu. After you click the small yellow arrow of step 1, step 1 shows in step 2.1. You can specify the formatting of the text in flow of event by highlighting them and selecting a formatting setting from the Format button. Let's turn the word invalid in red and then bold it. Highlight invalid, select Font Color from the drop-down menu of Font button and select red. Similarly, bold invalid.